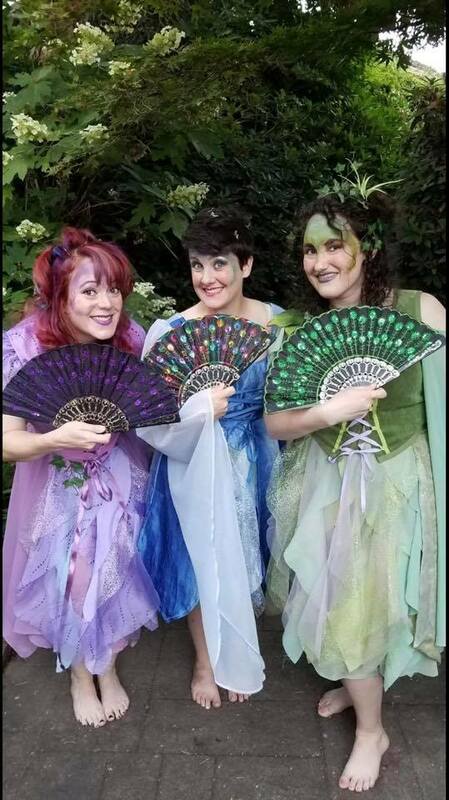 Light Opera of Portland (LOoP) made a tough decision this year – the local group has performed much of the canon of Gilbert & Sullivan over the past several years, and it was difficult to imagine them slighting the duo’s wildly successful 1885 comic opera The Mikado. However, The Mikado has become controversial in recent years, as the show’s inherent (if unintentional, by standards of the time) racism has been acknowledged by the broader community. The cultural and ethnic insensitivity of the show has been exacerbated by a long history of offensively stereotypical productions – typically including all white casts wearing yellow makeup, long pigtails, even exaggerated eye makeup to simulate “slanted” (Asian-looking) eyes. Like many other modern companies, LOoP has opted to re-set the show far from Japan, and to remove allusions to Japanese culture from the dialogue, music, costuming, and sets. LOoP took it a step further, by removing the story to a different planet. Hence, The Mikado, or the Town of Tipiyu has become The Outer Space Mikado of Planet Pitiyu. If you are not already a Gilbert & Sullivan fan, do not expect the show to make sense – just read the synopsis below, then sit back and enjoy the witty songs and absurd conundrums that plague the inhabitants of the isolated (and very humid) Pitiyu. The planet’s feudal structure includes the Emperor, the Lord High Executioner (Co-Co, who has never performed an execution), and the Lord High of Everything Else (Pooh-Bah), plus an assortment of nobles, wards, and attendants. Co-Co is determined to marry one of his young wards, Yum-Yum, but she is enamored of an itinerant musician named Nanky-Pu. Nanky-Pu admits to Yum-Yum that he is actually the Emperor’s son, but fled in disguise rather than marry the enamored, elderly Catischa. Tired of his ineffectual executioner, the Emperor decrees that Co-Co must behead someone within 30 days or be executed himself. Co-Co essays to save his own life and rid himself of a rival by executing Nanky-Pu, but then agrees to allow Yum-Yum and Nanky-Pu to marry and live in connubial bliss for 30 days before the groom is beheaded. Co-Co discovers he is utterly unable to actually kill anyone, so he sends Yum-Yum and Nanky-Pu away and, with the assistance of Pooh-Bah, convinces the Emperor that he has executed Nanky-Pu. When the Emperor learns that Nanky-Pu is actually his long-lost son, he is enraged, but Co-Co’s life is saved when Nanky-Pu and his bride return, obviously in excellent health. Co-Co reluctantly agrees to marry the now lovelorn Catischa, and the unlikely pair discovers that they have a lot in common. Everyone is very, very happy, we applaud, and meet the cast in the lobby before wandering over to the ice cream parlor for a little post-theatre indulgence. The LOoP production is literally littered with high points. The tiny orchestra, under the direction of Dr. Linda Smith, is perfectly suited to the scale and tone of the production. Lucy Tait’s costumes are simply marvelous – bright, colorful, flowing, and awash with extraterrestrial style. The set is studded with wildly alien flower and mushroom shapes, lit to create almost an underwater aura. Leads and chorus members have all mastered the fine art of snapping Spanish fans to accentuate their moods and ward off Pitiyu’s relentless humidity. Both men’s and women’s vocal ensembles are in perfect harmony; when the full company sings the power is stunning. That said, the show’s real stars are, well, the stars. As Yum-Yum, Lindsey Lefler’s exquisite soprano sets a high bar, but Sheryl Wood and Mandee Light are not far behind. Tenor Tom Hamann (Nanky-Pu) and baritone Laurence Cox (Pooh-Bah) help to anchor the men’s chorus, and Cox’s unbelievable sneer is a constant delight. The surprise standout for me, however, is Carl Dahlquist (Co-Co) – for both the power of his voice and his amazing comic chops. By Act 2, I was cackling so enthusiastically that I would have been embarrassed had my neighbors not been just as loud. LOoP’s innovative Mikado is long – almost three hours including intermission – but it never drags, and I was unaware of the passage of time until the final bows. There are only five more opportunities to see this carefully crafted revision that showcases the fabled Gilbert & Sullivan wit while deleting hurtful stereotypes, so I recommend that you work it into your plans for next weekend. LOoP’s The Outer Space Mikado of Planet Pitiyu is playing at 7:00 p.m. Thursday, Friday, and Saturday (September 27-28-29) and 2:00 p.m. Saturday and Sunday (September 29-30) at the Alpenrose Opera House, 6149 SW Shattuck Road, Portland. And Anne Hubble's amazing presence and volume as Catisha. Hails from Lamplighter company from San Francisco.